No one has ever heard a woman saying, her closet is full of clothes or does not require extra space in the kitchen. She has a valid point though. With every day passing the kitchen accessories increases its volume because every lady loves to buy new items. For this purpose, Outsunny Rolling Rattan Wicker is a rescuer for all the women out there. It emphasizes on providing additional storage other than usual Kitchen Island which is not for providing enough area. Therefore, this outdoor kitchen trolley cart is not only a store box, however, can be your kitchen’s decoration piece as well. The cart is made with the sturdy frame of steel along with the double rattan wicker body, and the top of the trolley cart is covered with 5mm hardened glass. The overall product dimensions are 21.5″/30.5″Width x 21.75″Depth x 35.5″Height. You will experience the wheeled legs with the ability to lock easily. 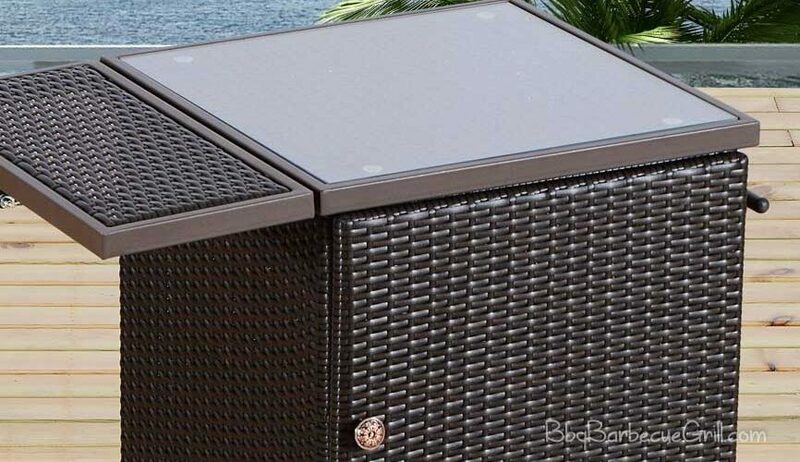 When it comes to enhancing the outdoor kitchen or grilling encounter the name that comes to mind is Outsunny rolling rattan wicker that can fulfill certain requirements. It attributes a section that drop-down for add on space. The doorway has got ample amount of volume within to organize your food prep utensils. There is another working space, which you can fold when not in use. Nowadays, everyone is willing to buy products that are multi purpose. You will be surprised to know this trolley cart also serve two functions. Firstly, as the name suggests; it is the cart design for outdoor barbeque parties. Secondly, it makes all house wives happy with its convenient shelves. Moreover, the deep coffee color complements the theme of your kitchen and furniture. The kitchen carts look like a chic and made keeping in view the latest trend. The frame is build up with the steel. Hence, you can make it your companion for a longer period. There is an extra flap on the outside of the kitchen trolley so that you can accommodate your grilling equipment without facing any difficulty. We know this kitchen trolley cart has designed for outdoor kitchen patio which will make a good impression on your friends and keeps your party going. It is a compact model which proffers high-class performance. The wheels render user-friendly experience and offer a great portability. We know it is versatile and multi-purpose, but unfortunately, the price range may not suit most of the buyers. The space inside the cart is not enough to hold things that weigh more, but it can hold platters, cutlery, and cups. A side shelf is an additional option though, the flaw that might irritate you is the poor quality, and due to the fact, this does not go far to provide extra coverage. Overall, we have covered all the aspects of Outsunny Rolling Rattan Wicker; it works beyond our expectations with high-grade quality and performance. In this modern world, you must have seen people are changing the traditional kitchen into the outdoor style kitchen and which is also gaining popularity. However, investing in this kitchen trolley cart is an awesome idea for those who want to spend peaceful time with their friends and family.